Anthea Alley was recognized in the late 1950s as an emerging British sculptor working with welded metal. She exhibited in New York with the Martha Jackson Gallery, and in London with Hamilton Galleries and later with Anneley Juda, and her works were acquired by notable private and public collections in Britain and the USA. This exhibition focuses on her early abstract metal sculptures and paintings as a starting point for future examination of a long and continuously inventive career. Alley initially trained as a painter at Chelsea School of Art and the Royal College of Art, and won a John Moores prize for painting in 1957. 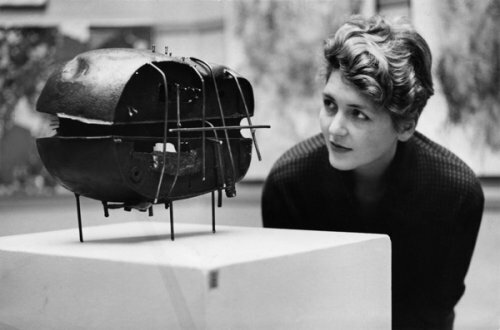 She started to make metal sculpture in the late 1950s when she found that her paintings “projected too far from the wall and yet still seemed insufficiently three dimensional”. These primarily earth-coloured paintings from the late 1950s and early 1960s were often textured with sand, hessian, metal and wood, and included collages in shallow boxes as they became increasingly sculptural. As a sculptor, she was virtually self-taught, and her first sculptural works from 1957 were observational studies of birds and animals. Her sculptures soon became completely abstract and evolved swiftly, becoming lighter in character than her matière-based paintings of the period, although she left her sculptures “roughly finished to preserve their vitality”. Alley’s paintings of the late 1950s have an affinity with the work of the same period of Sandra Blow, a fellow artist who was later to become one of her close friends: they shared an improvisatory approach and were both preoccupied with space and matter, making confident use of their coarse materials and textured surfaces. Another friend and colleague was the abstract painter Gillian Ayres with whom Alley shared several exhibitions in the late 1950s and ‘60s – they also taught together at Bath Academy, Corsham. Alley’s works of the 1960s and early ‘70s were made of brass or steel which she assembled together and welded. Influenced by both geometric shapes and architecture, particularly by “enclosed shapes with spaces inside” such as temples, pyramids and ziggurats, she noted that “the objects I make usually have random shapes running through them – a link with the space outside…”. Around 1962, Alley began to work with metal machine stampings (what remained of metal sheets after shapes had been stamped out from them). She produced a major series of works with this material, using the found patterns to create transparency and filigree traceries through the structures she formed with them. For visual consistency, the structure of each work was based on an individual type of stamped out metal sheet. They were “made in sections, dividing up air into slices, light enough to make the air round them seem solid, or heavy and stabile…”. Another series from the late 1960s/early ‘70s was based on a system of building in tiers: polished aluminium sheet was formed into half circles, half squares, or cones, that were placed on mirror-polished bases “in order to push the space down through the floor or out through the wall, thus extending the forms by illusion”. Throughout her career she retained what Sandra Blow described as Alley’s “fascination with improvisation and the use of strange materials”. In 1955, as a young painter, Anthea Oswell married the art historian and curator Ronald Alley (1926-1999) who later became Keeper of the Modern Collection at the Tate Gallery. The Alleys entertained artist friends and colleagues from all over the world: the abstract painters Paul Jenkins, Albert Irvin, Gillian Ayres and Henry Mundy all became close family friends. In the late 1950s, Sydney Nolan and his wife, Paula Rego and her husband Victor Willing, and Wilhemina Barnes-Graham were among those who lived in the upstairs flat at the Alley’s riverside home in Putney. The Alleys had two daughters, and although they divorced in 1973, they maintained an affectionate friendship and continued to share their family house, living on separate floors. They remarried shortly before her death in 1993. In the late 1980s, Anthea Alley had a relationship for several years with Ralph Rumney, artist and co-founder of the Situationist International. He lived with her at Putney and she gave him invaluable support and encouragement just before the resurrection of interest in his work. This was characteristic of her generous spirit – as Sandra Blow commented later, Alley never pushed herself forward and her conversations were “filled with her wit, curious invention and kindness…”. Anthea Alley’s works are represented in public collections including The Arts Council of Great Britain, Tate, Birmingham City Art Gallery, Contemporary Art Society, London, and the Whitworth Art Gallery, Manchester.